A TV with the "Start Screen" for the SuperNintendo game, Final Fantasy 2 (which is actually Final Fantasy 4). 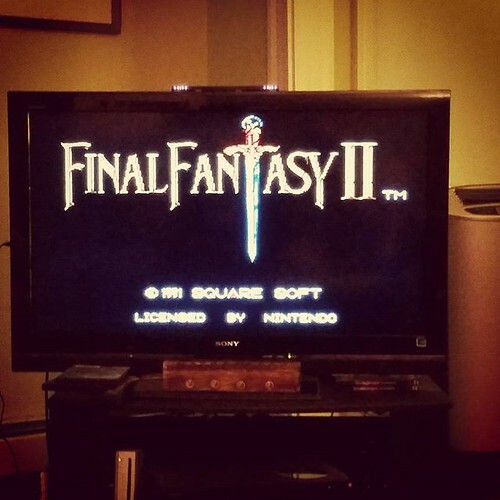 So the other night, I decided I didn't have too much on my to-do list and thought I might enjoy a relaxing evening playing Final Fantasy IV--a game that I have mentioned before in this blog and rather enjoy playing time and again. I know the game backwards and forwards--but like any good RPG (role playing game), it is like a book--it still holds sway over you for decades later and you long to return to the adventure. To me, there is little difference between revisiting this game (a game that can take 20 or more hours to beat) and opening up The Lord of the Rings or the DragonLance series--both of which I enjoyed greatly in my youth. However, this time around, I decided to make it a bit more interactive and began live-tweeting my gameplay along with pics of particular moments in the game. When asked why I decided to do this...well, because it was fun and a way of sharing my gaming experience with others--particularly people who grew up in the 1980s and 1990s loving this game and others. If you want to keep up with the game-play, I'll be posting them to this folder on Flickr.